We are not currently hatching or selling any chicks or pullets, but if you would like to incubate eggs and hatch chicks yourself, we do have fertile hatching eggs for sale. Incubating eggs can be shipped to any location in the state of Virginia, but we do not ship anything that has already hatched. We also offer poultry supplies such as predator-proof chicken coops, laying boxes, hanging feeders, waterers, all-natural feed, grit, oyster shell, and much more. We do not have any chick hatches planned for this Spring, but we do have fertile eggs for sale if you would like to hatch your own. There is more info on hatching eggs at the bottom of this page. Additional chick information (please read): There is a Virginia state law that requires the purchase of no fewer than 6 baby chicks at once. All chicks under 8 weeks of age are subject to this minimum. 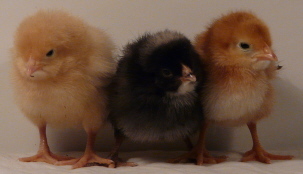 You can choose any combination of breeds that you like, as long as the total number of chicks comes to at least 6. Also, please keep in mind that chicks will need a warm, safe environment away from older chickens until they are old enough to withstand the elements and pecking order. Scroll down this page for more information on hatching eggs and raising chicks successfully. We are not planning to have any pullets for sale this Spring. "like" us on Facebook for automatic updates on future poultry availability and other farm news! We will post on our facebook page if any hens become available in the future. Barred Rocks are a hardy American breed with a striking black & white feather pattern. They are good layers of light brown eggs, and will occasionally decide to "set" (hatch) their eggs. The hens have bold personalities and tend to rule the roost. Males are sometimes aggressive but very beautiful, with more white in their feather patterns than the females. Quite bright and adventuresome, Barred Rocks make excellent foragers and are one of our favorite breeds. 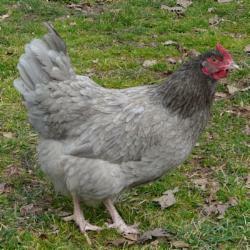 A calm, laid-back English breed that loves hatching eggs and taking care of the chicks. 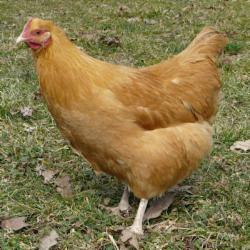 Hens are a soft golden color and lay large, light brown eggs. Roosters are a brilliant, shiny gold with flowing tails and lovely crowing voices, and are seldom aggressive. The hens are friendly and excellent with children. A few Buff Orpingtons make a wonderful addition to any flock, but keep in mind that they can be rather stubborn about their desire to be moms, so unless you plan on allowing them to hatch chicks regularly, it would be wise to keep them in a mixed flock with other breeds that do not have a strong nesting instinct. 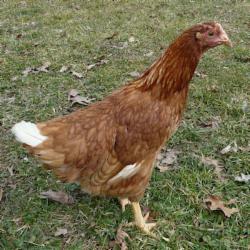 This is a hybrid breed, with Rhode Island Red and Delaware parentage. 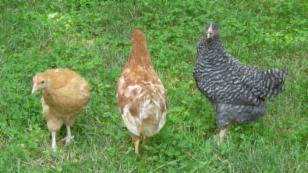 Hens are light auburn in color, with some white or black highlights. They are excellent layers of big brown eggs, and have friendly temperaments. Roosters are mostly white, with a dark red "saddle" mark on their backs. Because they are hybrids, a male and female Red Star will not hatch Red Star chicks, so most people choose this breed strictly for their exceptional egg-laying ability and calm demeanor. Good choice for children! Often called the "Easter Egg Chicken", because these attractive hens lay eggs in pastel shades of blue, green, and olive. The eggs are darker colored when the hens first start laying, and lighten gradually as the birds age. The yolk and white are normal color and taste just like other eggs, although some of our customers say they can tell a difference. The birds themselves come in a beautiful array of patterns and colors, including solid white, but their legs and feet are always olive green or blue. Most Ameraucanas have muffy little beards that make them look like Muppets. They do not typically hatch their eggs, but there are exceptions. The strain that we currently offer is bred for egg-laying rather than exhibition, so if you're a serious show-breeder they may not suit your needs. However, for the casual hobbyist, these birds are lots of fun and perfect for anyone who wants something different. 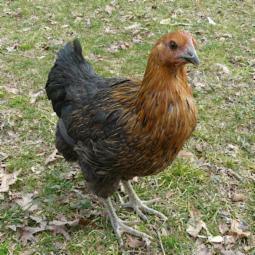 This is a hybrid breed, with Rhode Island Red and Barred Rock parentage. Their color can range from completely black to varying degrees of a pretty golden lace pattern (up to approximately half gold), with a beautiful green/purple iridescence on the darker feathers. They are curious, people-oriented chickens and excellent layers of big brown eggs, but do not usually decide to incubate their eggs and hatch chicks. Because they are hybrids, a Black Star hen and rooster will not produce Black Star chicks. This French breed is relatively new to America, and is still fairly rare. Marans lay eggs that vary from very dark brown to lighter brown with dark brown speckles, and belong to a class of poultry known as the "Chocolate Eggers". The eggs are the darkest in color when the hens have first started laying (around the age of 6 to 7 months), and gradually lighten in color until the birds take a short break from laying. When the eggs resume, they will again be a very dark color. The varieties we have are blue, which is a lovely smoky gray, and Blue Splash, which is white with flecks of bluish gray. Hens are quiet, well-mannered, and make very good setters. 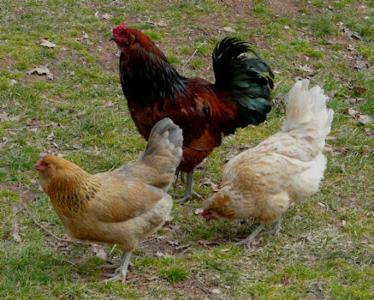 Marans are a large breed; hens weigh 6 to 7 pounds, and roosters top out at 9 to 10 pounds. Due to their extreme size, Marans roosters (although gentle and mild-mannered) should not be kept with smaller breeds of hens. Because of their rarity in Virginia, as well as our limited supply, Marans cost about twice as much as most of the other breeds of chickens we have for sale, but for the collector or serious hobbyist, a couple of these stately hens are a fun and beautiful addition to the flock. - Chicken eggs hatch approximately 21 days from the start of incubation, give or take a few days. -The ideal incubating temperature for poultry eggs is 99.5 degrees F.
-The ratio of males to females averages 50/50, but you can never know ahead of time....and it's entirely possible to get all males or all females in any hatch. -If you're using an incubator without an automatic turner, you will need to rotate the eggs 180 degrees at LEAST twice daily until the 18th day of incubation, when turning should cease. We recommend that you use a pencil to mark one side of each egg with an X, and the other side with an O, to help you keep track. It's also a good idea wear gloves while you turn the eggs, so the oils on your hands won't clog the pores in the shells that allow oxygen to pass through. -Chicks hatch with a 2-day supply of food already inside them, but once they all dry off they'll need to be removed from the incubator and placed in a warm (90-95 degrees F) area with chick food and a chick-safe waterer. Use an old T-shirt on the floor for traction, and if you notice the chicks crowding under the heat source, they are too cold. If they're panting or avoiding the heat source completely, it means they're too hot. Watch them carefully and they'll tell you what they need! -If you would like to use a hen to hatch the eggs for you, wait until you have one that is spending all night and most of the day sitting in the nest (That's called "going broody"). Move her to a secure area where the chicks will have a safe place to live for a few weeks after they hatch (enclosing the area under the laying boxes usually works well, if that's an option). Give the hen a day or two to re-adjust and make sure that she's still willing to stay on the nest, and if so you can get her some eggs to hatch. Carefully slip them under her in the daytime, and if all goes well she'll be a proud mama in about 3 weeks! She will take care of keeping the chicks warm, but you will need to provide them with a chick-safe waterer and free-choice chick food once they hatch. Good luck! 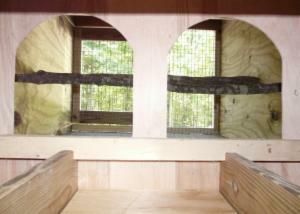 Click the photo to see our ready-made hen houses. Click the photo to see our poultry accessories.